Last week,we had gone for apple picking in the nearby farms here.And believe me,I never had such tasty,juicy & delicious apples from stores.Kids really enjoyed apple picking and it was real fun for them to pluck apples from the hanging bunches all red & ripe.The farms had both red & golden delicious apples.So,what's all this blah blah leading to..you all might have understood by now,Isn't it? ?Yess..Today's recipe is made with those delicious apples and its the home made apple jam.Earlier I had posted the Home made Grapes Jam,Do check it out here.Though jam making involves frequent stirring & efforts but its real worth making.The home made jams have the real taste & flavor of fruits embedded in them which is lesser in the store brought ones.So,give this a try & enjoy!! -Wash,peel & core the apples,Cut into small cubes.Keep aside. -Blend half of the apples in the blender with very less water. 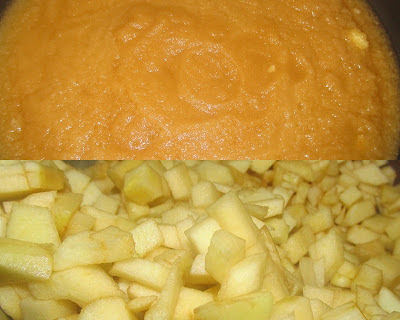 -Add the remaining cubes into the sauce pan or non stick pan along with pureed apple,enough water to cook the cubed apples and sugar.Keep on medium flame,cook covered for 10-12 mins,until the cubes becomes soft & tender.Mash it with a potato masher or wooden spatula. -Keep stirring the mix otherwise it may stick to the bottom of pan.It may take 30 -40 minutes on medium high flame to reach the jam consistency.Add the lemon juice/citric acid towards the end when its 90-95% done.Mix it well. -Check test to see if done: Add a tsp of mix on a clean dry plate,wait for a minute.Hold the plate at 45 degrees to see if the jam is slipping down.If its done,the jam will not slip from the place you placed. -Put off flame at this point and let it cool down completely before storing. * You can use any variety of apples except the green ones as am not very sure of the taste of jam with those.Adjust the water content accordingly to cook the apples more or less. * Add the sugar little by little.Increase or decrease the sugar as per your taste buds. * Adding food color enhances the color of the jam and gives a golden touch to it.You can omit that if u wish. * You can puree the whole apples too and boil it to get the same results,but that takes more time of stirring and thickening takes longer. * Adding cinnamon & cardamom gives an added flavor to jam like Kissan jam in India. * I have added lemon juice in the recipe,it acts as a preservative and prevents crystallisation of sugar. * Use glass bottles preferably to preserve jams & pickles.Also,sterilise the bottles,lids before use or sun dry the clean bottles for an hour so that no moisture remains in it.This increases the shelf life & stays good for months. Seeing the apple jam recipe, I guessed so that you went for apple picking.. We too went last week.. was looking for ways to use it up. Lots of apples lying around.. Delicious and tempting jam..
Homemade is always perfect. Must try. wow...jam looks perfect, great recipe...will try this soon(going Orchard this weekend, so will be try this very soon) thanks for sharing...lovely presentation! Delicious looking jam and beautiful pics! Such a nice and yummy jam!!! We just went apple picking this weekend and I've been searching for recipes to use them up..this looks perfect! Omg! perfect apple jam. Looks too delicious Julie. Love it. Yum! Yum! And so simple.. can't wait to make this.. 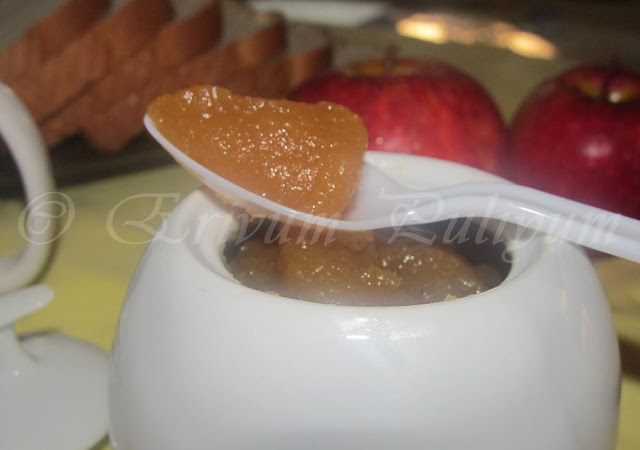 Delicious apple jam Julie, Love it. I love apple jam. You have made it perfect..Tempting and mouthwatering! 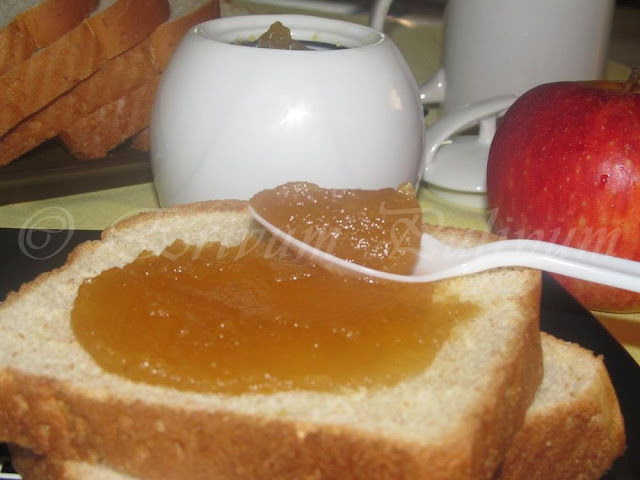 yummy & delicious apple jam and happy to know your kids enjoyed picking apples. yeah it is fun for them. kind request, If possible please add some of the photos of apple farm. 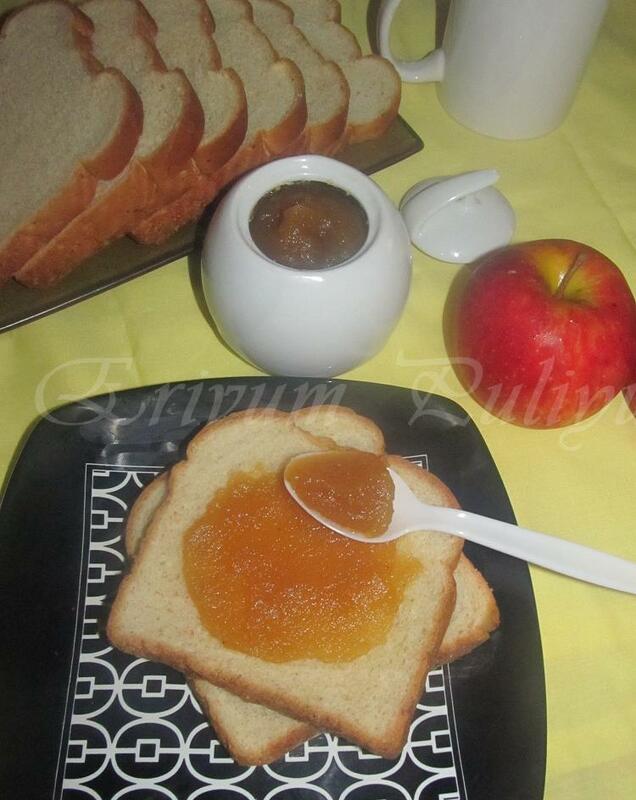 Apple jam looks so yummy.i am gonna try this today and will let you know how it has come out..Thanks for the recipe..
homemade are always best.. love it..
bookmarking this Julie... will try this soon.. long time thinking of making a jam..
Homemade are best and healthy ...delicious recipe and a must try for me! Wonderful looking jam,nothing will beat the homemade ones. Thanx all..:)@Shireen SequeiraAm fine dear,Thanx for dropping by Shireen..Do give it a try & Enjoy! Home made is the best,delicious..
your apple jam is superb!how beautiful presentation julie!